We would like to thank everyone who brought in a shoebox this year. In total we got 85 boxes! We would like to thank everyone for supporting Team Hope and helping children in Eastern Europe and Africa. 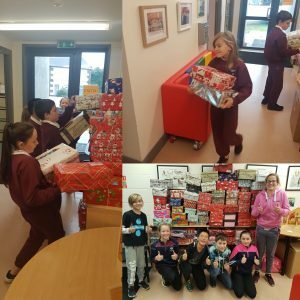 The children who receive your shoebox will be delighted with it! It is very important to look after the children who are less fortunate than we are, especially at Christmas time because they deserve a nice Christmas too. We are delighted to have sent all the shoeboxes over and we hope to do it all again next year!